An important point is that rangeland cover type refers to the existing vegetation, not the potential or climax vegetation. Every piece of ground is unique and somewhat different from any other piece of ground. There are several very good vegetation classification systems that have been developed to assist in the discussion and analysis of management actions. The many vegetation classification systems utilize a number of descriptors to describe and classify similar vegetation units including cover types, habitat types, seral stages, vegetation types, ecotypes and vegetation series. The Grazing Impacts website uses the vegetation classification system developed by the Society for Range Management and published as Rangeland Cover Types of the United States T.N. Shiflet, 1994. The Rangeland Cover Type classification system is felt to best meet the analysis needs of those people most likely to be evaluating grazing impacts. 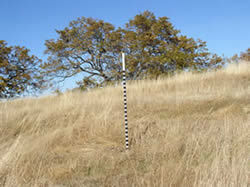 Cross references to other classifications such as wildlife habitat types, vegetation types, vegetation series and plant communities are provided in many cases. An important point is that rangeland cover type refers to the existing vegetation, not the potential or climax vegetation. The existing grassland cover type found on a site can be climax vegetation or it could be a seral grassland vegetation stage created by a disturbance factor such as fire, grazing or mechanical treatment that has removed shrubs or trees. A brief description is provided for each of the rangeland cover types for which livestock grazing impacts to selected indicators have been evaluated. Additional rangeland cover types and indicators will be added to the website as time and resources allow.